The plan is to make Chicken Mole- in fact I have my ancho, California and guajillo chilies ready for the sauce. But someone whispered "teriyaki" in my ear and I cannot refuse. I also have a bag of Persian cucumbers for pickling which will be a nice accompaniment to it. I let it sit for an hour while I make my Pickled Persian Cucumber. The recipe of which can be found in an earlier post. Then it's time to work on the teriyaki. I used a non-stick pan for the dish and again, my thanks to whoever invented the non-stick pan as it make everything easy. The goal is to brown all sides which is difficult if using a regular pan because anything marinated in soy sauce will stick as the soy sauce caramelizes- but not on non-stick pan yippee! After browning all sides, place all the chicken pieces back to the pan and pour the marinade. Simmer on low occasionally turning them over. When the marinade has reduced to a thick sauce, scoop the chicken pieces out and transfer the sauce to a bowl. Clean the pan and heat oil about three rounds or enough to coat the pan. Repeat the browning process for each piece until they're all golden brown. Then pour the sauce over the chicken making sure to coat every piece. Transfer to a serving bowl and serve with steamed white rice or steamed vegetables. 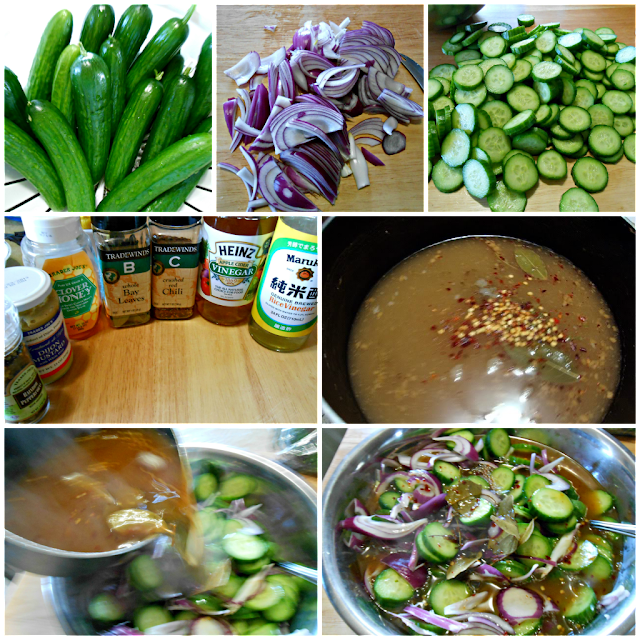 I stuck to the plan and served it with my Pickled Persian Cukes.